Raiding my Tarot store cupboard, I spied an Oracle deck I’ve wanted to use, but never have, so for the purposes of the blog, I’ve decided to draw for us all, a Power Animal card for the coming week. So shuffling the deck (after wiping the sticky stuff off from one of the kids!) I drew The Bear. When I opened the deck the other day, this was the card at the top of the deck. I felt the message then, just as I do now. Her key phrase is “stand your ground” and we as a family have lots of things planned for this weekend. 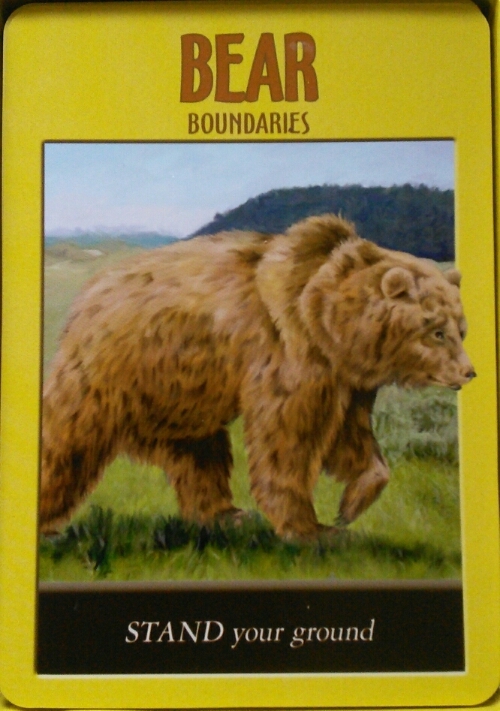 Reading what Stephen D Farmer wrote in book, (p25) this bear is about defining who you are and who you are not. When you can say a clear “no”, then you have the knowledge to say a clear “yes”. Mercury is retrograde at the moment, so the time to keep your boundaries and thoughts in check. Others may not know what they want. Chances are, neither will you. You and others might have a better chance of knowing what you don’t want, more than what you do, but that’s okay! So where do you want your boundaries set? What are you comfortable with? What do you wish to do? What do you not wish to do? Stand your ground and I hope you have a great week! After a morning visit to my husband, I have the rest of the afternoon for myself which will include some blogging and a lot of reading and of course playing with my new deck The Chrysalis Tarot. Sorry I thought I had told you. He is living in a care facility because ten years ago he has suffered a sever stroke which has caused a left side paralysis and brain damage. I’ve tried to take care for him myself but after two years I had to admit this was to hard for me.